When you bang on a simple drumhead, it will most certainly make a noise, but you probably wouldn't call that noise a musical note. "You hit it, and it generates all of these vibrations in random relationships to each other. As a result, you get a thud," said Frank Wise, the Samuel B. Eckert Professor of Engineering in the Department of Applied and Engineering Physics. Why does a drum make a thud, when clarinets and guitars can produce notes and chords? The difference is dimensionality: In a narrow tube or taut string, oscillations of the air within the tube or of the string are one-dimensional. In contrast, a drumhead is two-dimensional, and its vibrations usually are more complicated. "But imagine if all of the vibrations of the drumhead were locked together," he said. "Then you'd get a different thing – a note." Essentially that is what Wise and doctoral student Logan Wright have done with their instrument of choice: the laser. That is the subject of their paper, "Spatiotemporal Mode-Locking in Multimode Fiber Lasers," published Oct. 6 in Science. Also contributing was Demetrios Christodoulides, professor of optics and photonics at the University of Central Florida. Wise and Wright have submitted a patent application for this potentially revolutionary laser method. The lasers with which most people are familiar are the result of photons (particles of light) operating in coherence – in other words, the crests and troughs of the light waves are in sync. Ordinary light, such as that from a light bulb, comprises multiple, noncoherent wavelengths in three dimensions, and thus scatters. The modes of a laser resonator are three-dimensional, as well, with variations along the axis of the resonator as well as two transverse dimensions – up and down, and side to side. But the common laser – such as that found in a laser pointer – restricts operation to a single transverse mode. "Nothing is changing in the transverse dimensions," Wise said, "so it's essentially a one-dimensional device." That doesn't mean the other patterns of light aren't there, and Wise's group has proven the ability to lock those other "colors," or wavelengths, together. And not only are all the wavelengths locked, but so are the different three-dimensional spatial patterns of laser light. "It's locking of time and space," Wise said. "Light at high intensities behaves differently from what we're used to," Wright said. 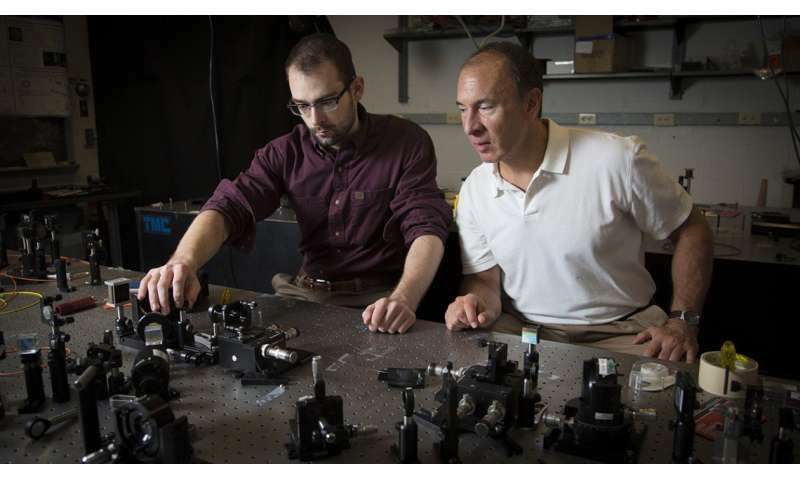 "We were able to design the laser so that this mode-locking happens by itself – interactions between those modes actually cause the light in the laser to self-organize." Wright calls this "the world's first three-dimensional mode-locked laser," but what could it be good for? A few things, said Wise and Wright – who both were quick to point out that what they've done is demonstrate a concept, not invent a useful new tool. "It's going to take a lot more work for that," Wise said. Super high-power lasers, since the light within the laser can be more spread out and therefore the peak intensity (concentration of energy) can be much lower. Controlling the emittance of the beam so as to create a specific pattern in space-time. In theory, this could be used to first catalyze a reaction in a complicated molecule with a pulse of light (to excite specific vibrations or energy levels), then record details of that reaction with another pulse a few femtoseconds (quadrillionths of a second) later. "This could be useful for studying reactions of very complex molecules, such as are found in biological systems," Wise said. Wise and Wright believe their idea could push forward a technology that's pretty much been locked in one mode for more than 50 years, since the laser's invention. "Just as you'd be surprised to hear a note come out of a drum," Wise said, "people will be surprised to hear a spatiotemporal pulse come out of a laser. We're using degrees of freedom that hadn't been used before." If we can't hear the shape of a drum, I would doubt we can hear the shape of a laser, but this may help with optimal/non-optimal dynamics for determining translational surfaces. When hitting a drum (snare drum for example) then use your other hand to press on the drum head and the thud changes tone. By practicing how hard the drum head is pressed on you'll hear different tones, and they can be used musically as notes. Quite. Simply listen to the use of tympani in Beethoven's 9th symphony for proof.